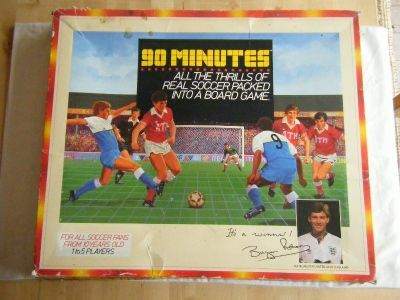 Another version of 90 minutes. I think this is the slightly older version before Peter Pan Playthings distributed the game. Much is similar to the other version click here. 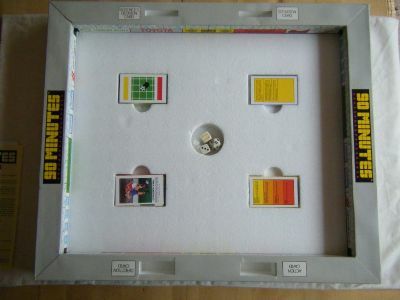 A large square box with a strange American looking football illustration. 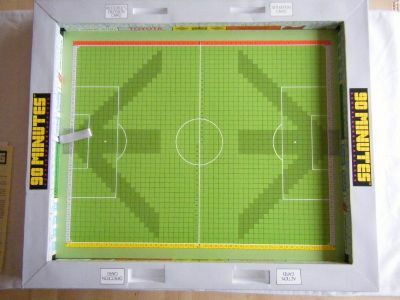 The pitch is located in a large expanded polystyrene box that becomes the stadium surround. It is extremely strong and durable. The pitch is identical to the other version. All the cards and playing pieces are the same as in the other version. The stadium graphics are excellent and the perimeter advertisers are well known brands.